This is our last Blogging A from Z post. The mission was a success and soon the space capsule will splash down. Crowds will cheer and confetti will litter the web. But before we blow the bolts on the hatch door and get some much-needed rest, let’s take a moment to reflect on everything we talked about this month. Just let all that new data dart around inside your skulls like a bunch of zero gravity pennies. Zymurgy is the term used for the fermentation process when making beer or wine. Today we’re using it as a stand-in for those times a writer needs to let a story rest for a while. There are three critical times when halting writing might actually be a better plan then pounding away at the keys. At the start: According to Stephen King, the projects he can’t forget are the ones he knows are winners. He reportedly let UNDER THE DOME ferment for decades, making not one, but two failed attempts before the time was right for committing it to print. If you’re sitting on a five-year-old story idea you can’t stop thinking about, that is most likely the story you should pick up next. And it’s okay to let that story bubble a little longer while you finish something more time sensitive. Passion for a great book idea builds and gets better over time, while the lesser stories will fade away and be forgotten. Between revisions: Once a draft is done, walk away for a while. Take some time to read and relax. You might not be able to completely put the story out of your mind, but try to. Work on something different if you must keep writing during the break. Stockpile a few blog posts while you wait! Setting your work on the shelf makes it possible for you to see the words on the page clearly. You will start to spot all the mistakes you would have read over when what you intended to write was still fresh in your mind. After feedback: Nothing good comes from attacking your work with a hatchet after a bad critique. Stop! Ask for clarification on the feedback. Talk about the critique with another trusted friend writer. I know critique is hard, and when harsh words come from someone you trust, it tempts you to cut to the bone, or to dismiss the criticism. Waiting helps you gain perspective. When you wait, sometimes what first looked like a condemnation of your whole book project turns out to be a few afternoons of editing. Problems look easier when you’re less emotional volatile. All revisions call for some zymurgy. By letting the feedback sink in, you can accept your own mistakes and take responsibly for fixing them. Zymurgy has many fine uses, for example, when you get a bad review or a few angry commentators invade your blog. Take a deep breath and count from 30 to zero backwards by 3s before you do anything. Also remember, many wonderful, mind-blowing books were not written overnight. If the time and energy it takes for you to do your best work is slower then your fellow writers, so be it. You might be judged unfavorably in the short term against their speed, but in the long term, quality shines over quantity every time. I’ll have to come back and read more of your posts later. I like the way you tackled Z. A perfect and encouraging post to end on. Congratulations on getting to Z! Zymurgy – what a fabulous word for this process! I especially like the tip about not acting on feedback right away. When I’m too emotional, it’s hard for me to find the way to address an issue. But if I let it sit, inspiration often hits me where I can see a way to make things much better than they were before. Sorry, I missed this comment yesterday. I think feedback should have at least a few days, if not a full week to cook before it’s acted on. You can’t hear clearly once your emotions get too keyed up. I know what you mean about this month, I should have increased my outgoing comments to other blogs by at least 50% but I was working harder, not smarter. I learned a lot this year about managing my social media. For one thing all the blogs I can follow on the WordPress reader are getting swapped over in the new few weeks. I just don’t have the time to log in at three or four different places to see if people are posting new content. This will make checking in with the blogs I really liked, and staying connected with the friends I made this month simple. Congrats on finishing the challenge! You ladies rocked it this year. I loved your posts! Thanks! I’m glad you liked my creative vocabulary. 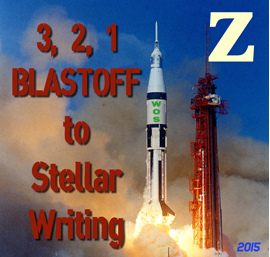 Z is always a total nightmare for me, I never know how to make it work for a writing craft post. I ended up reading the Z section of my BIG hard bound dictionary and running a crazy list of words by Heather until one stood out. I think you rocked it this year. Your photos are just so amazing. I’m still mulling over your paths photos and planning how I can turn my horrible, run down, dingy, mess of a rock garden into a Japanese inspired paradise. Great tips and what a great way to end the challenge. Congrats on completing the challenge! I enjoyed what you did this year too. Your Lego photos always make me crack up, and my kids love them! After I finish a draft, I always put it aside to sit for a while. I think most writers who take their work seriously practice some form of zymurgy. It’s common sense! You just can’t see the problems when you are in the thick of writing, you need a bit time and space to clear your head. Back at you on the BIG congratulations. Your stories were so creepy and fantastic all month. And they became a perfect way to introduce some new vocabulary. Hats off to you for a great theme! Second: Great idea for today’s post. I agree with the idea of writers taking a break after finishing a project, and I recommend it too. It took me 2 years to write the first draft of my WIP. Once I did, I took a 6-week break before starting Draft 2 revisions. And I’m glad I did. It allowed me to catch up on life in general, focus on a couple smaller short-term projects, and figure out a plan for the Draft 2 process. It was SO weird not working on the novel for that long – but it was welcome in other ways, and very necessary. I’m so happy to hear you like the series. It was fun. And Heather and I both loved the template format for writing posts. I think it’s safe to say we will be dreaming up another series for next year’s A to Z. : ) We haven’t had much time to plan out what we might do with the posts yet, but I can assure you it’s on our minds to do some form of giveaway this year. Great minds think alike. After this hectic month, I think we all deserve a happy hour! Thank you so much for coming by, and for leaving many wonderful comments. I love the use of Zymurgy for this particular area of the writing process. The tips are great because letting a story rest for a while is really important, especially if there are changes to be made or something is bothering you about the work. I’ve enjoyed your theme for the challenge, and will value the tips and advice both you and Heather shared with us. It’s a shame to get off the ride, but you’re right about the much needed rest! Thanks for providing us with so many great resources. On a separate note. I’m so sorry to hear about your beloved pet. I’m thinking of you, and your family. Oh, thank you. Everyone has been so kind. This week has been truly hellish. My son’s cat Zip was one of those one in a million kind of pets. We will never forget him, but hopefully (down the road a bit) we will learn to remember him and the good times without so many tears. Great way to end A-Z and something I have to remember to do – give it a rest!! We all need that step back moment, it makes our work so much better! Enjoy your end of challenge R and R, I know we will. : ) And thanks again for stopping by.